The lush island of Phuket, Thailand is one of South East Asia’s must-visit destinations. Depending on what you want to do while you’re in Phuket, you can choose from unique of hotels that will serve as the most convenient base of operations on the island. Arguably one of Asia’s most romantic, intimate, and luxurious resorts, The Pavilions Phuket promises a once-in-a-life-time vacation from the top of a hill in Phuket’s Chang Wat region. Visitors can choose from an array of rooms like The Pavilion’s luxury suites or their spacious and private pool villa, all of which provide the perfect summer escape. The Pavilion’s is also a great base of operations if you really want to discover the best that Phuket has to offer in terms of local attractions, culture, beaches, and food. As a delicious bonus, The Pavilion is also home to not just one but three award-winning restaurants and bars, all of which prepare gourmet dishes to please even the most discerning of palettes. Retreat to an oasis surrounded by the breathtaking emerald waters of the Andaman Sea when you visit The Naka Island, a Luxury Collection Resort and Spa located on Phuket’s Naka Yai Island. The island is truly nothing short of paradise with its pristine tropical beaches, remarkable landscapes, colorful vistas, and thriving coconut groves. Rooms at The Naka Island are spacious, homey, and absolutely comfortable, with hotel staff making sure you have every amenity at your disposal at all times. Of course, a trip to the beach isn’t complete without a milieu of water sports to go along with it. This is exactly why The Naka Island makes resort activities accessible to all guests through boat tours, sailing and windsurfing opportunities, kayaks, bikes, and more. Forget your daily grind for a few days and retreat to the 5-star accommodations and beachfront location of the JW Marriot Resort and Spa in Phuket, Thailand. Known for its location on the gorgeous Mai Khao Beach and for being just a short drive away from destinations like the Royal Phuket Marina or Phuket Yacht Haven, the JW Marriot is your doorway to VIP treatment in Thailand. Top accommodations at the JW Marriot include the family suites and the Royal Villa, both of which feature amazing private pools, widespread ocean views, and spacious quarters. Not to be forgotten are the fantastic amenities like deluxe bedding, marble bathrooms, flat-screen TVs, and high-speed internet. An island paradise with a new perspective on beach vacations, the Amari Phuket is all about giving guests the opportunity to escape to somewhere secluded. The first thing that greets you at this oasis is a canvas of blue skies and turquoise seas as well as fantastic amenities that achieves the pinnacle of luxurious island living. 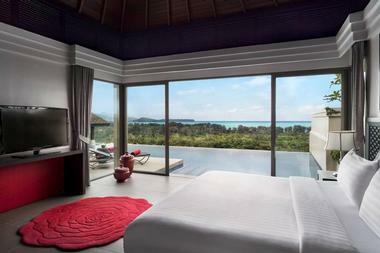 Rooms at the Amari Phuket are spacious and so beautiful that they’d make great additions to your Instagram feed. Superior and Deluxe wing rooms are known for being bright and airy with beds that you can just sink in to, while the Ocean Wing rooms are known for their elegance, floor-to-ceiling windows, and a great view of the bay. 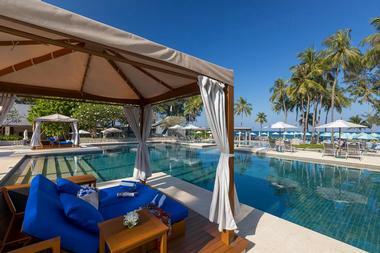 Retreat to a peaceful beachfront paradise overlooking the Andaman Sea at the Anantara Layan Phuket Resort. This lavish tropical heaven is nestled on a lush hillside, which allows you to enjoy a view of the tranquil cove and colorful beach beyond. Engage with other guests and unwind through dinner feasts at a cliffside chapel or at the beachfront. Masters of Muay Thai are also at the ready to help you learn the ropes of this amazing martial art, after which you can retreat to the Anantara Spa for rejuvenation by way of a Thai massage. All in all, the Anantara Layan Phuket Resort has 30 rooms and suites, 47 luxurious pool villas, and 15 pool residences from which you can begin your exploration of the Andaman’s multifaceted beauty. Put your dream vacation together and design your own personal paradise experience at the Anantara Mai Khao. 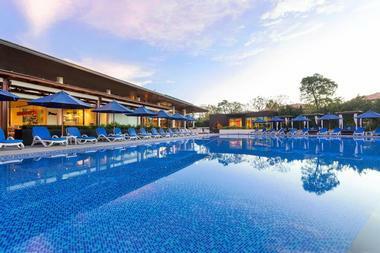 This resort frequently offers specials, all of which are available with the click of a button. The Anantara Mai Khao’s specials allow guests to save on a dream family destination, delve into a world of exclusive and limited-time benefits, and enjoy every luxury that Anantara has to offer. Take a rejuvenating retreat with the Anantara’s wellness package and a few nights’ stay at a private pool villa or go on a time-tested therapeutic retreat known as the Ancient Healing Renewal, which comes with a bamboo massage in a room that overlooks a lotus-filled lagoon. 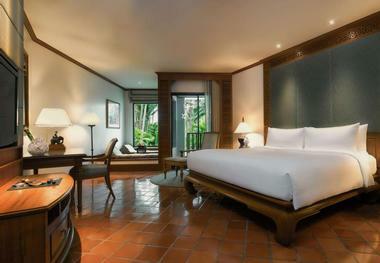 Truly, a trip to the Anantara Mai Khao Phuket Villas is one of great possibilities. 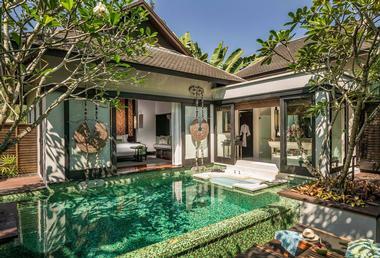 If you’re in desperate need of renewal and relaxation, then you’re definitely going to want to check out the Angsana Villas resort located at the gorgeous Laguna Phuket. The resort is a tropical haven that boasts tranquility and residential-style accommodations to make you feel like you’re at home. 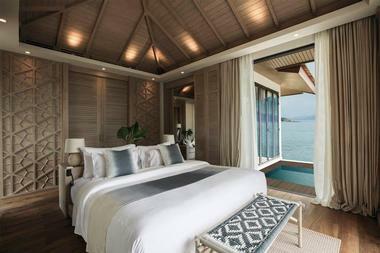 All villas include kitchenettes, a dining and living area, and a Thai Sala pavilion for ultimate relaxation. Guests have access to all of the resort’s fantastic amenities such as the swimming pool, the Kid’s Club, the Fitness Center, and the Panache Restaurant and Poolside Bar. Don’t forget the award-winning Angsana Spa and Golf Courses, which are also open to all resort guests. Eager to get a taste of island life in Phuket? Why not book at a stay at the BYD Lofts Boutique Hotel and Serviced Apartments. 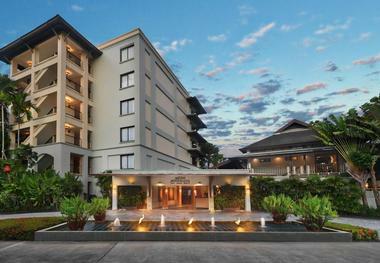 The BYD Lofts are one of Phuket’s leading hotel-style accommodations known for their modern aesthetics, fully furnished apartments, and affordable rates. The space is armed with every modern convenience you can think of, and you will be very happy with the comfortable rooms. Choose between the 1-Bedroom Grand Deluxe Suite, the 2-Bedroom Penthouse Suite, the 2-Bedroom Grand Deluxe Suite, and the 1-Bedroom Grand Deluxe Pool Access Suite. Guests can also enjoy fresh and contemporary European bistro cuisine and Thai food at the BYD Bar & Bistro or enjoy a cup of coffee and treats at the Café SOHO. 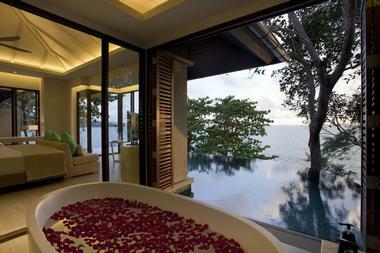 Do you want to be treated like a queen or a king during your Phuket getaway? 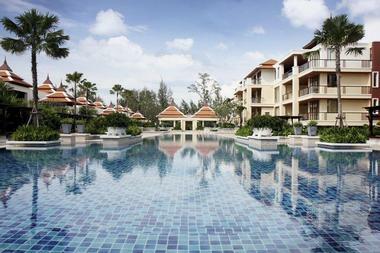 Well, the Cape Panwa Hotel Phuket is literally fit for royalty. With an extensive clientele made up of royals, celebrities, and avid travelers alike, the Cape Panwa has carved out their own little slice of paradise in Phuket’s southeast corner. Notably, Cape Panwa was one of the first luxury hotels in the area, and it perfectly encapsulates the best of tropical grandeur by blending natural beauty with modern amenities and excellent service. Enjoy a stay at one of the sea-facing pool villas and take advantage of access to an exclusive beachfront while you’re at it. Sitting at the tip of Cape Yamu with sweeping views of the spectacular Andaman Sea, the COMO Point Yamu offers a memorable experience of contemporary Thai luxury. The rooms at the COMO are designed by Paola Navone and are marked by Italian furnishings and accents. Meanwhile, the COMO Point Yamu is also home to two world-class restaurants, each serving choice Thai and Italian Cuisine, while the COMO Shambhala wellness retreat is just next door to the hotel. At COMO, you can slip out of day-to-day life for a moment and escape to world of pampering, privacy, and a pristine swathe of sand and beach. 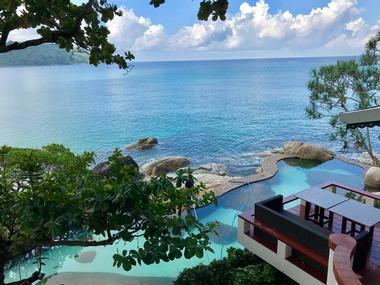 An iconic luxury and 5-star resort, the Kata Rocks goes above and beyond the usual resort by allowing guests to experience only the best that exclusive oceanfront living has to offer. 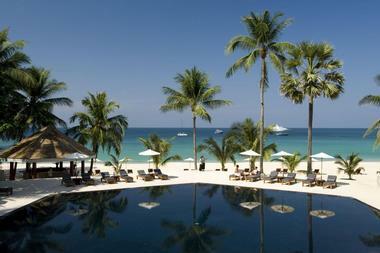 The resort overlooks the calm and clear waters of the Andaman Sea and sits right on Kata Beach. Beloved by the local elite and visitors from all over the world, Kata Rocks Resort and Residences shines as an iconic location with fantastically designed villas of which the private pool villas and signature Sky Villas are the most popular. Don’t forget the innovative and gourmet dining that is available to guests and the exclusive state-of-the-art spa located within hotel grounds. Forget your ordinary beach vacation and be inspired by a brand-new take on paradise at the Le Meridien Phuket Beach Resort. Situated on a secluded cove in the south-western coast of Phuket, Le Meridien entices guests with limitless discoveries, incredible facilities, and quality service that is sure to exceed every expectation that you have. Staying at the Le Meridien gives you access to a private and immaculate beachfront, endless land and sea sport opportunities, ten amazing restaurants and bars, two humongous swimming pools, and a relaxing and opulent spa experience. Traveling with kids? No problem. Le Meridien also has an onsite discovery center for your young ones to explore when they’re done spending the day at the beach. 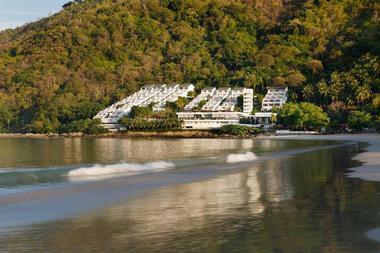 The jungle meets the sea at the Marina Phuket Resort. Perched on the southern point of Karon, which is known for being one of the finest and most famous of Phuket’s west coast beaches, the Marine Phuket Resort gives guests direct access to the best of the island’s natural beauty and marine life. Think luxurious jungle living, because that’s exactly what you’re going to get. The Deluxe Villas at this resort offer breathtaking views of the Andaman Sea, while the wooden walkways of the resort also give you the chance to explore the jungle of Phuket. Dine on fresh seafood, enjoy magnificent sunsets and sunrises, and discover every inch of natural beauty that you can at this place, because there’s just truly no other quite like it. Eager to surround yourself with elegance and luxury? Head to the Marriot’s Mai Khao Beach for an unforgettable vacation at a prime location marked by unabashed luxury and elegance. Located on Mai Khao Beach, the Marriot is close to some of Phuket’s famous attractions such as the Nai Yang National marine Park and Fantasea. Additionally, guests at the Marriot also have access to world-class hiking trails, amazing scuba diving opportunities, and unforgettable kayak trips. Rooms at the Marriot are beyond stylish with full kitchens, plush bedding, and private balconies to give you a view to remember. There’s something magical about visiting Mom Tri’s Villa Royale. Apart from being a top-rated boutique hotel in Phuket at the white sand beach of Kata Noi, Mom Tri’s offers an extraordinary opportunity to experience peaceful and refreshing beach life at one of the last hideaways the island has to offer. The hotel offers just 42 suites to maintain the highest standard privacy possible, while the interiors and architecture are distinctly Thai. Authentic Thai antiques meld with modern luxuries, giving the hotel a unique character and charm, while the panoramic ocean view and thriving tropical gardens exude tranquility at its finest. Make sure to take a dip at Mom Tri’s salt water pool, take a dip in the freshwater pools, or dive into the turquoise waters of Kata Noi beach to rejuvenate yourself and wash away the wear and tear of everyday life. Blending the best of classic Thai style and contemporary design, the Mövenpick Resort offers 40 inviting residences to guests from near and far with the intention of making your vacation one for the books. Just a couple of steps from Bangtao Beach, Mövenpick’s bright and breezy luxury residences treat your body, mind, and soul to ultimate relaxation and bliss through exceptional service, top amenities, and the glory of Thailand’s natural beauty. While the resort is great for visitors from all walks of life, athletes and fitness enthusiasts will definitely love Mövenpick because of its proximity to the starting lines of huge competitive events like the Laguna Phuket Triathlon, the Phuket Ironman 70.3, and the Laguna Phuket International Marathon. 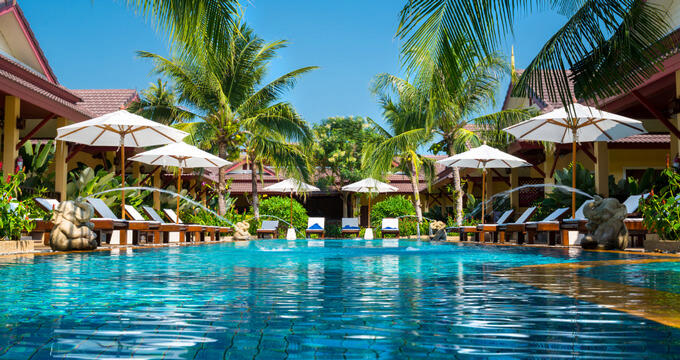 Arguably one of the most coveted addresses in Phuket, the Outrigger Laguna Phuket Beach Resort captivates all of its visitors with stylish dining experiences, a tranquil lagoon, and a high-class lounge. The hotel has twelve different kinds of rooms available to guests, all of which have their own unique features and quirks, making every stay unique experience. Enjoy top amenities alongside unbeatable guest services, all of which are bound to take your vacation from ordinary to out of this world. Don’t forget to make the most of the Signature Experiences that the Outrigger has to offer, all of which are designed to ensure your complete and total immersion in Thai culture. 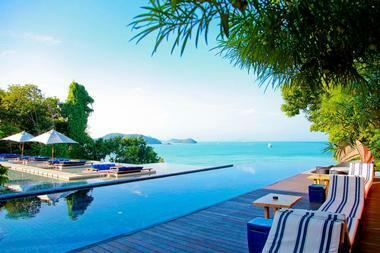 If heaven were on earth, it would probably be located at the Paresa Resort Phuket. At Paresa, the business of the outside world fades away and time comes to a halt. 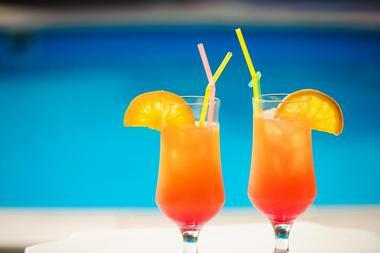 The resort is perched on top of seaside slopes, nestled within the lush tropical forest of the island. Guests are treated to unrivalled views of the pristine blue waters of the Andaman Sea and the colorful horizon from within the comforts of 5-star luxury. With a spectacular coastline to explore, the Paresa Resort allows guests to retreat to the seclusion of a magical island paradise while creating new memories that will last a lifetime. Combining lifestyle and design for the purpose of both business and leisure, the Pullman Phuket Arcadia Naithon Beach Hotel invites all visitors to experience what they’re sure will be your new favorite holiday home. The hotel is perched on a piece of headland that overlooks the gorgeous waters of the Andaman Sea, which means that every visit will be one of utter tranquility and relaxation. You also have direct access to a pristine beach so that you can make the most of the resort’s beachfront. Meanwhile, suites in the hotel exude sophistication and a cosmopolitan feel, melding modernity and the island’s natural beauty together spectacularly. Get a taste of paradise when you book a stay at the Renaissance Phuket Resort and Spa, a 5-star accommodation in the center of Thailand’s most beautiful beaches. A stay at the Renaissance promises luxurious amenities such as pillowtop bedding, sleep bathrooms, spacious villas, and more. Food at the hotel is also top notch with several restaurants offering divine dishes to set your taste buds ablaze. Looking for complete relaxation? Well, if the amazing beachfront isn’t enough, you can retreat to the 5-star Quan Spa, which boasts an incredible range of treatments designed to send you straight to a place of utter bliss. 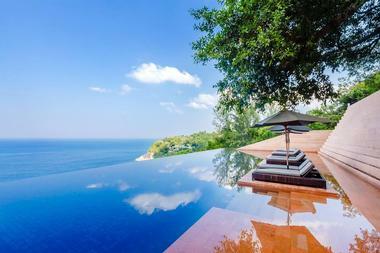 Spend a weekend in a villa that stands 40 to 60 meters above sea level at the breathtaking Sri Panwa Phuket Resort. 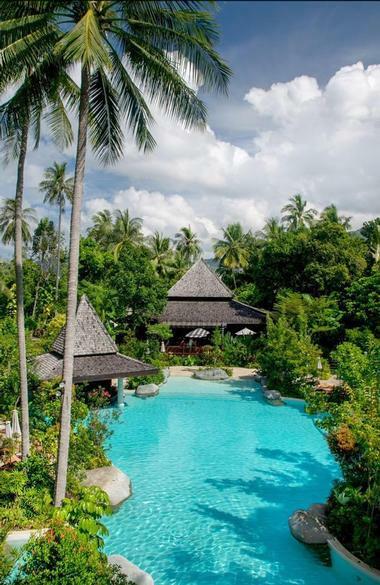 Located on the southeastern tip of Phuket, the Sri Panwa occupies the Cape Panwa peninsula and is a gateway to one of the calmest and most luxurious paradises on the entire island. Each of the 52 villas at the Sri Panwa boast incomparable views of the Andaman Sea, while the interiors of the villas can only be described as Tropical Contemporary. Integrating the natural jungle and ocean with modernity and comfort is certainly one of the Sri Panwa’s strengths, so rest assured that your visit will be one of complete relaxation. Whether you’re looking for a way to restore your senses, a romantic sanctuary to escape to by sea, or you just want to stay in a hotel with a gorgeous view of the beach and bay, you’re definitely going to want to look into a stay at the tropical paradise known as the Nai Harn Resort. Booking a room at the Nai Harn is akin to settling in your own personal private haven armed with the most innovative technology that the industry has to offer, gorgeous designer amenities, and tons of floor space. We can’t forget to mention the fact that every room also has a private terrace that beholds fabulous views of either the mountain or the ocean. Facilities at the hotel are also spot on with an indulgent spa, a bar, restaurants, and sports and recreational amenities available to guests. An elegant resort situated on the picturesque Pansea Beach, The Surin Phuket promises an exceptional stay at one of their 103 cottages and suites at Phuket Island’s west coast. The resort grounds are punctuated with lush coconut palms and gentle slopes care of the forested hillside, and they exude an understated elegance that will, without a doubt, cause every visitor to fall in love with the resort. Beyond the luxurious amenities, spacious rooms, and sophisticated interiors, what makes The Surin Phuket so special are the small but thoughtful touches and efforts that they make for each of their guests. At the forefront of the resort’s heart is a desire to pamper guests and treat them like royalty for the duration of their stay. 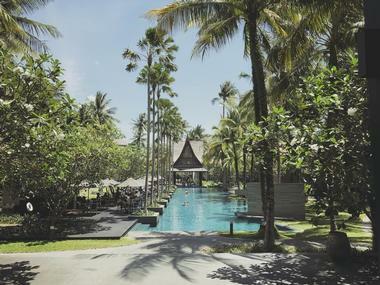 A boutique 4-star hotel nestled in a cozy patch of land on the island’s southwest coast, the Windmill Phuket Hotel is perfect for families who are traveling together and eager to experience the paradise that is Phuket. The hotel is popular in the region because of its proximity to Yanui Beach. 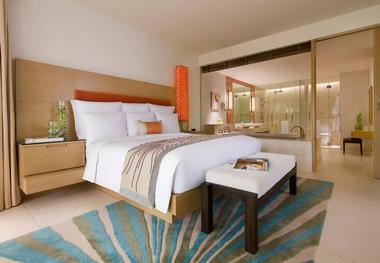 In fact, it’s the closest in the area, and its oversized rooms are designed to accommodate the entire family. There’s no end to the facilities that families can enjoy – the Windmill Phuket boasts a 40-meter pool, a kid’s pool, a massage area, a steam room, and even a 24-hour gym. Want to explore the nearby hot spot of Rawai? Tuktuk rides are complimentary for all guests of the Windmill, while use of recreational bicycles is also available free of charge. 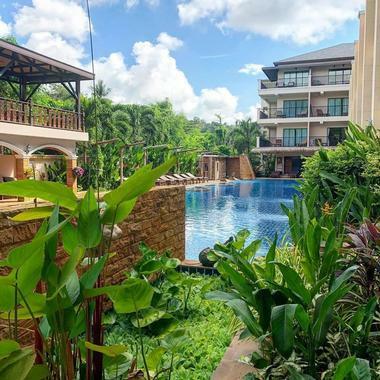 If you’re eager to experience the most luxurious and most lavish Thai getaway that Phuket has to offer, then look no further than then Twinpalms Phuket Resort. 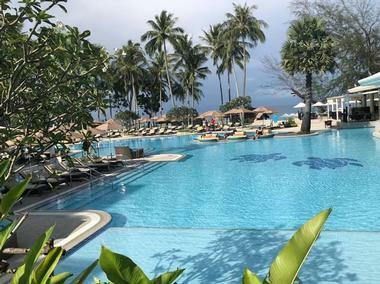 Nestled in an area of Phuket known as “millionaire’s row,” the Twinpalms Phuket Resort is an exclusive, exciting, and stylish beach getaway that offers unparalleled comfort and tranquility to all of their guests. The resort boasts of 97 extravagant residences, suites, and rooms, all of which are nestled within a throng of palm trees. Many of the rooms also feature a private terrace that allows guests to enjoy a relaxing view of the pool and gardens to give your spirits the boost its needs to truly recuperate from the madness of everyday life.